Double sided walls arestronger and thicker than conventional concrete walls. It has the same texture onboth sides. No "bad" side! Invisible panel interlock. long lasting colour thatnever fades. Absolutely no maintenance. Clean neat installationwith less impact on your time and privacy. These strong walls willenhance the safety and value of your property. Cap rail trim included aspart of the finished product on walls or not, at a discounted rate. Can be combined with steelpalisades in you brick crete concrete wall. 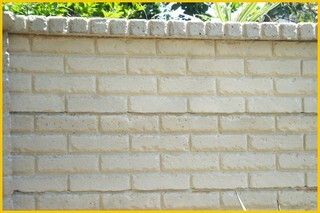 The Brick-crete wall hasthe same aesthetic quality of a solid brick wall, yet cost only a fraction ofthe price. The Brick-crete wall cannotrot or burn! Ideal to replace rottingwooden fences. As concrete becomes stronger in time, you will never haveto replace it. You can to paint it. Concrete reaches astrength of 30mpa after 30 days. The products are cast with a maximum definition and minimum tolerance, so that no further treatment is necessary. Panels: 2 x 4mm spring spring steel. Foundation: 350mmx 350mm & poles are planted 600mm deep.